Yesterday was the 2015 Flight of the Bumblebees. It’s a fun short contest put on by the Adventure Radio Society. Richard Fisher, KI6SN does most / all of the heavy lifting to make it happen. For that, I and many other hams who participate, are grateful. My wife Kathy was snickering as she said it. She loves poking fun at me, all of it in good spirit. That’s how it is after nearly 41 years of marriage. It was the best analogy I could come up with on the fly. I was late leaving my house as the contest was already underway for 50 minutes. No doubt my CW and outdoor radio mentor Jim Cluett, W1PID, had already scored twenty or more QSOs. He’s so very good at outdoor radio and can hear Morse at up to speeds of 35 words per minute (WPM) or so. I’m a pathetic 10 WPM on my best day. But I’m having fun and getting better all the time. I just need to spend more time doing it. Jim has a 57-year head start on me. But I digress. To be a bumblebee you need to be outdoors. The weather here in central New Hampshire was dismal. It was cloudy and rain felt like it could fall at any time. The cloud ceiling was well below 1,000 feet. I had decided to drive to a 90-acre parcel I own and operate from the top of a grand hill. There I could erect a sloper antenna pointing to the west and southwest where most of the other bees would be. My plan was to get up there, set up, get a Q or two and then call Jim to come up and work with me. He lives just twenty minutes away. That’s a short drive in central NH! But Jim must have ESP. He foiled my scheme! “What’s up?” I was in shock he was calling me and I was only on the road for about ten minutes. I was both happy and disappointed at the same time – disappointed that my plan had been spoiled. It turns out that happiness ruled the rest of the day. Once up at my land, it took virtually no time to set up my par EndFedz multi-band 10/20/40-meter antenna as a sloper. The top end of the antenna was a good 30 feet in the air and the matchbox end with my RG-174 coax cable was about 8 feet off the ground. I had it sloping to the SSW. Jim arrived just as I was about to move my truck so I could extend the coax cable into the cab. The mosquitos were thick and hungry and it seemed it could pour at any moment. “Are you just putting your stuff away?” Jim knew better. Within a few moments we were on the air with my trusty HB-1B. We tried my little portable speaker so we both could listen, but the internal battery was low and it was causing all sorts of RF with the radio. Out came the earbuds and we each shared one. Within two minutes I had worked K4BAI. Hah, I say “I” but it was “us”. Jim was logging and using his SUPERIOR listening skills to capture call signs and all else the first time. It normally would take me a few minutes to *hear* a fellow ham’s call sign as I often can only get one letter or two in a string at a time. 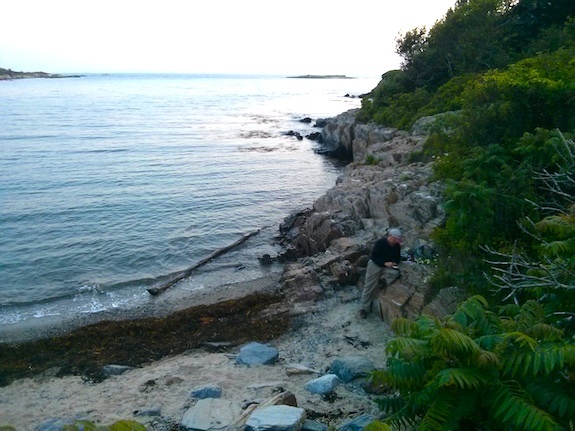 Jim has often scolded me about me sending kelp to someone who’s in distress needing *help*. We were both in the truck cab laughing and having a great time. It was then time for a break. Often during breaks we shoot guns. When we had our fill of lead and smoke, we operated again. I switched to 40 meters and BOOM there was N3AO. “That’s Carter!” Jim was talking about Carter Craige, the husband of the president of the ARRL, Kay Craige. Jim and Carter are old friends and I got to meet him last summer at the ARRL Centennial Convention. I sent him my call, but he didn’t recognize it. Jim took my micro Pico paddles after I signed off with Carter and all of a sudden they stopped sending dah. The cable had gone bad. How experienced is Jim? He immediately put the paddle on it’s side and used the dit side as a straight key to complete the QSO with Carter. I dug into my plastic box and pulled out a spare cable to make the Pico paddles work again. We then worked N4HAY – I say we, but it was all Jim as he heard him first time. By then it was time to pack up and leave. I have to say that yesterday was in the top three of all my outdoor outings with Jim. I had a blast and felt good about hearing lots of what was sent by the other hams. I’ll never be as good as Jim, well maybe I will, but it doesn’t matter. What matters at the end of the day is just friendship and having fun – no matter what the speed. Author’s Note: I do have a goal to get to 18-20 WPM. When I’m really proficient at that speed, I’ll be ordering an Elecraft KX3 as a present for myself. Who knows, by then it may be the KX4! Today I found myself in western Maine helping to get communications set up for a world-class racing event – the New England Forest Rally. I was with two fellow hams, Mark Kerrigan – K1MLK, and Ryan Freise – KB1VLC. 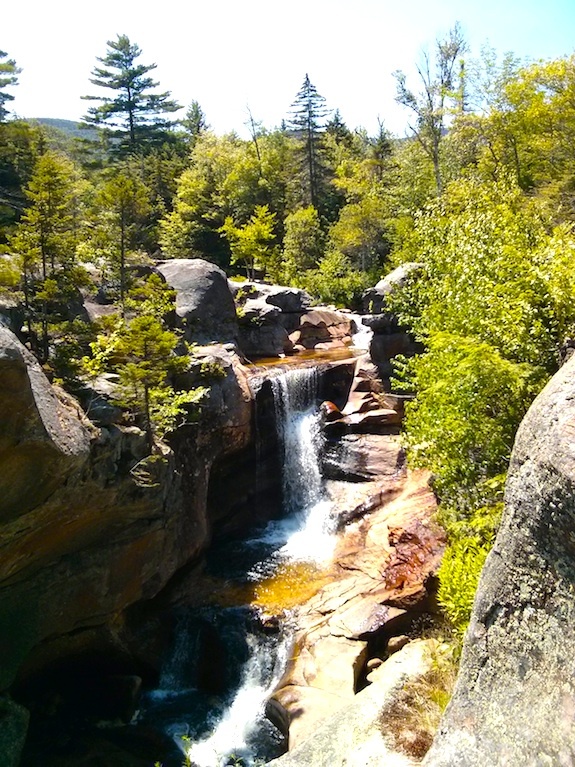 We had to drive from the Sunday River ski resort in Newry, ME up past Errol, NH to a narrow gravel road the racers would zoom down on Saturday July 18, 2015. We were there to pinpoint the start and finish lines and the places where radio operators would observe the race. The day was drop-dead gorgeous. Blue sky, low humidity and temperatures in the mid 70’s F.
By noon our mission was complete and I had the rest of the day free. 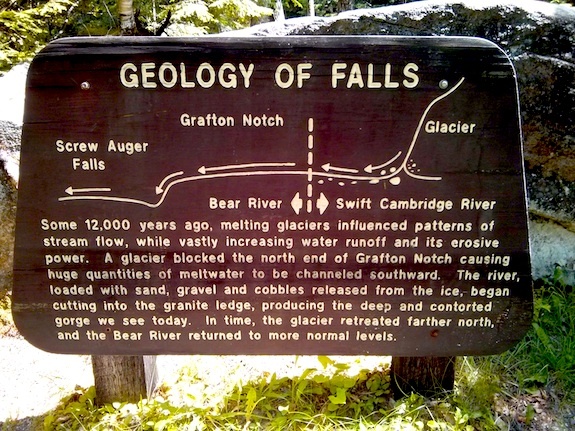 On the way from Sunday River, we passed through Grafton Notch State Park. I saw a sign for Screw Auger Falls and decided that’s where I was going to eat lunch and operate. The falls are in the Bear River that starts at the head of the notch. This natural wonder was created by the retreating continental glacier about 12,000 years ago. 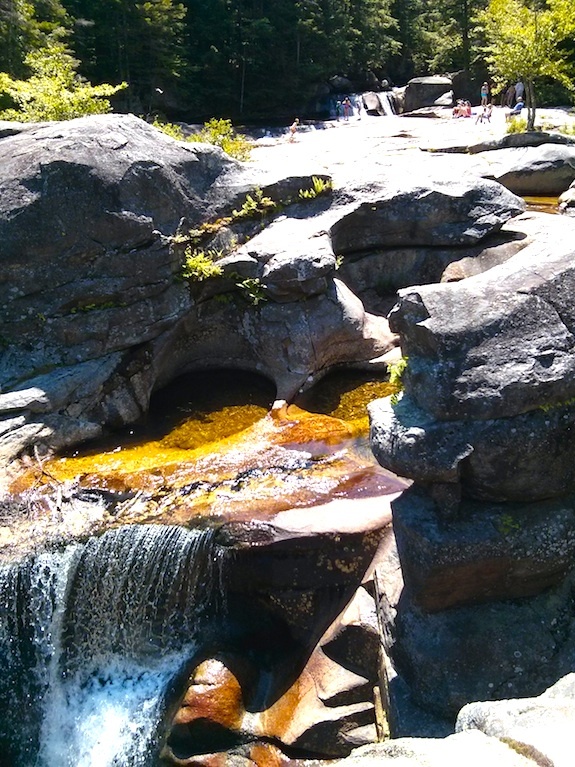 On this day I shared this magical place with families with small children who splashed and played in the crystal-clear water flowing down Bear River towards the falls. I’d say at least thirty or forty people were at or around the falls, but I found a place on the bare bedrock just above the falls where I could eat lunch listening to the water bounce off the majestic rock. The solid granite resembled carved wood with the smooth grooves cut by the moving water those thousands of years ago. While eating lunch I pondered what the sound must have been like when the giant glacier was melting and cutting away at the dense rock. 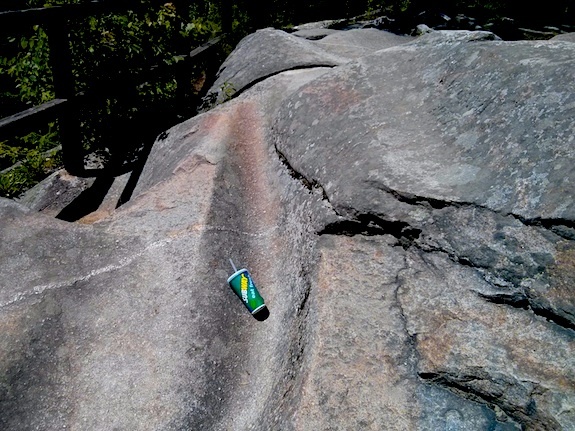 How much water was flowing down over the bedrock? Was it like Niagara Falls of today? Was it even bigger? Who knows. I also thought about my very good friend and mentor Jim Cluett, W1PID. Here I was on my first real solo outdoor radio adventure. There’s no doubt he would have loved this place and I said a prayer that I would not get skunked. That’s my goal now when I go out. No skunks. I had plenty of time on this brilliant afternoon, so I was feeling good about keeping any skunks in the adjacent woods. I was anxious to operate and wanted to get away from all the people. I walked up a trail into the woods and there were private eating areas along the Bear River with very nice picnic tables right at the edge of the small river’s banks. Each table was perhaps 60 feet from the other with plenty of trees to provide privacy. I found an empty one with a perfect tall birch tree to accept my par EndFedz 10/20/40M antenna. My first throw was perfect but my microcord line came undone from my special backpack retention hook and dangled in the air 9 feet above me. Drat! I pulled down the line and three minutes later had my halyard up in the tree at the perfect distance for my 20-meter antenna height. The wire hung perfectly vertical next to the table. 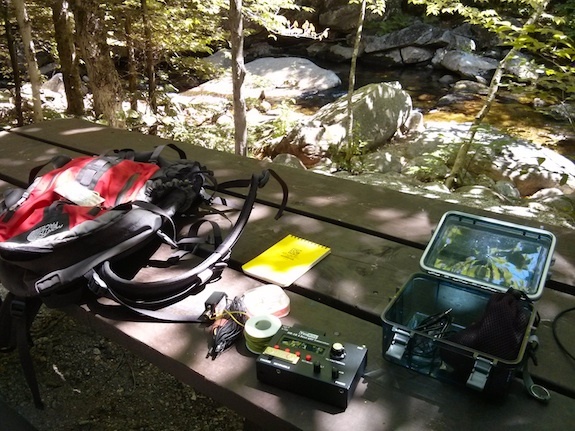 Within minutes I had my HB-1B radio out with the micro Pico iambic paddles and my mini speaker attached. All of this fits into a tiny water-resistant plastic box. Once I was set up and turned on the radio, I thought something was wrong. I heard absolutely no signals across the entire portion of the 20-meter band my license privileges allow me to work. I decided to go down to the low part of the band just above 14.025 Mhz. That’s where the pros are and maybe, just maybe, one might work me if he heard me. I started to call CQ. I did it for ten minutes and there was nothing. No answer – nothing. I rotated the tuning dial and went higher up. Once again, I called CQ for probably eight minutes. I then decided to go back down to 14.025.20. All of a sudden someone answered back! His signal to me was very strong. The only issue was he was sending Morse code a little bit faster than my brain could process it. I had his call sign correct. Of that there was no doubt. I gave him a 589 signal report and he gave me a 389. Alone there at the picnic table I savored not getting skunked. When you operate outdoors as I do, so many things are against you. But on this day, I walked back to my truck pleased. I had newfound confidence that I can just about get a contact from anywhere at anytime. On Friday, July 10, 2015 I was loading up a few last-minute things into my Super Duty Ford F-250 4×4 truck. At 8:00 a.m. I was supposed to pick up my good friend Jim Cluett, W1PID, at his home. We were then off to Lobstercon! This event has been happening for nearly twenty years and it’s a cozy gathering of ham radio operators that prefer to use 5 watts or less of power when transmitting. Sometimes some operators nuzzle up to 10 watts. In ham radio, low-powered operation is referred to as QRP. That’s a Q-sign meaning reduce power when transmitting. I arrived at Jim’s house a little early. That’s always a good idea because his watches and clocks run about 15 minutes fast for some reason. He was ready to go and his sweet wife Judy was helping us load up his gear and food. Little did I know at this point how much delicious food and fresh fruit she had packed for our little-man-self-discovery trip. “It’s not Miami. It’s Concord,” Jim said. Going to Concord would allow us to use roads that are rated for higher speeds, but Google Maps told me that the route I picked would get us there at the same time with less mileage. Chatter filled the truck and the time passed faster than a bat swoops through the air. 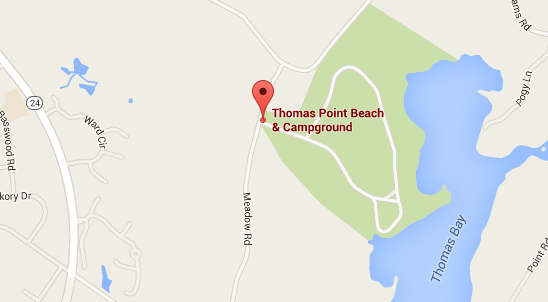 By 10:45 a.m. we had arrived at the Thomas Point Beach Campground, the center of the vortex of Lobstercon. It was a handsome campground with fine manicured large lawns and many lofty trees that provided lots of shade and some pine pitch. Jim was instructing me based on his past experiences at this festive event. This was my first time at Lobstecon and I was worried if there was some crazy initiation for first-time attendees. Within a few minutes I had my tent up, but I had it pointed the wrong direction. It had been 40 years since I had really camped and slept in a small tent, so it was going to be a re-learning experience for sure. Here’s the tent. It set up in just minutes. Much faster than Jim set up his. CLICK the photo to order one! I had a swell Eureka two-man tent with a wonderful rain fly. I bought it nearly twenty years ago for a father / daughter Girl Scout camping trip. For some reason the trip never happened and the tent had been stored safely for all that time. Once we had our tents up, we went exploring to see who was there. The first person I met was Carl Achin, WA1ZCQ. He has a forty-three-year-old orange tent he sleeps in and it was set up right in the middle of a large grassy area. He’s a very sociable person and told me all about his thin antenna up in the air and the *white reflector* on the ground. Most other people would have called the white wire laying on the ground a counterpoise. But I digress. I got to meet Seab, AA1MY and his lovely wife Sharon. They were camping for a week and had a very cute small teardrop trailer that was ultra-compact. It have a delightful screened vestibule that would easily accommodate four chairs and a small table. Soon it was time for lunch and Jim and I went back to our camp site. Oh my was I hungry and it was delicious. It was a vegetarian medley inside a pita bread. Boy did it hit the spot. I really loved the wonderful brown waxed paper it was wrapped in. We then ate a few delicious cookies made by Judy. The afternoon was spent visiting with many of Jim’s radio buddies and I got to meet all sorts of radio icons and titans in the QRP. 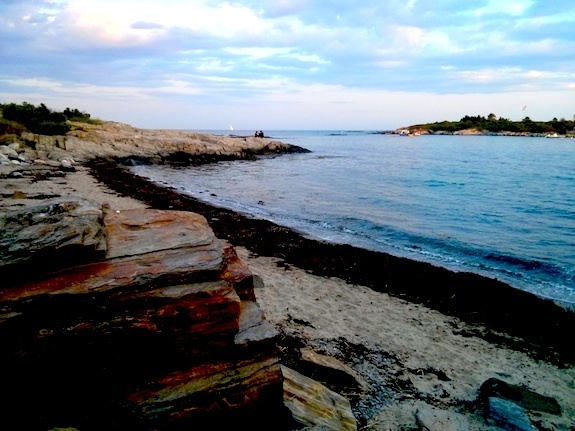 The plan was to go to Cook’s famous restaurant at the end of Route 24 on Bailey Island just the other side of the world-famous crib bridge between Bailey and Orr’s Islands. About twelve people went to dinner here from the campground and Jim and I sat at a table with Dave Benson, K1SWL and his wonderful wife Katie. As we ate dinner the sun was getting low in the sky. 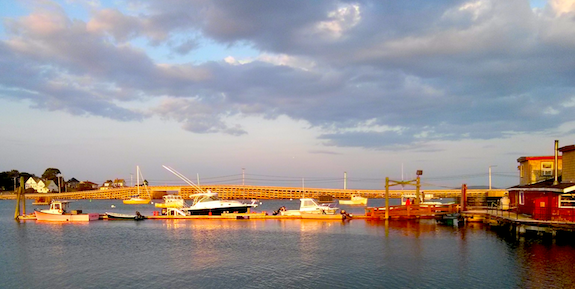 This is when the color temperature is very warm and the crib bridge looked simple stunning. After we ate, we raced down to Land’s End where Route 24 stops at the sea. It’s a very popular spot and some other locals or tourists were there too. Jim decided to set up his radio to see what would happen. The options for an antenna were bleak. He decided to attach his 27-foot wire to the open window of my rear cap. It was just 6 feet off the ground at that point. The antenna then stretched across some small trees and who-knows-what down to the rocks just by the salt water. I’d say the average height of the antenna above the ground was maybe 4 feet. I was down helping but had to leave because the mosquitos were thick as thieves and hungry. Within a few minutes, Jim had worked three DX contacts all in Europe. I was astonished that horrible antenna would work. It must have had something to do with the proximity to the salt water. After getting back to the campground we helped Seab get his sloper antenna soldered and working. We had started the project before dinner. Just after getting it hooked up, I went back and went to bed. I was beat. I was restless all night sleeping and although I had a nice inflatable pad, I was not comfortable. It could have been much worse had I just slept on the ground. 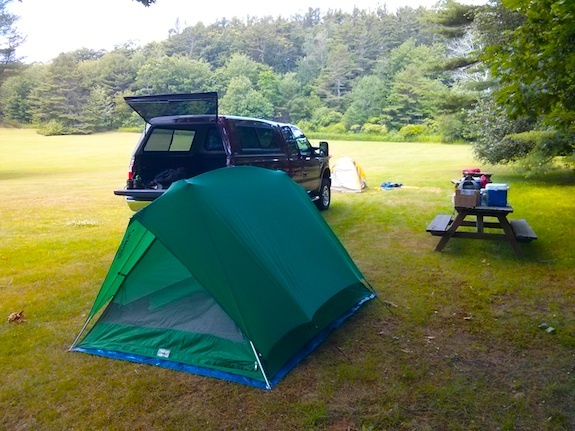 At 5 a.m. it was light but a nearby camper decided to fire up his Honda 2000-watt generator. They are renowned for being quiet, but believe me it woke me up and kept me awake. By 7 a.m. Jim was up and we had a delicious granola and strawberry breakfast courtesy of none other – Judy! The morning was spent with more visiting and introductions. The event organizers had a wonderful lunch spread with burgers, hot dogs brats and all sorts of great dressings. By 3:30 p.m. it was time to head home. Jim had seen all his friends and I had my fill of the event too. We didn’t stay for the trademark dinner of lobster – the dish the event is named for. I recommend you attend Lobstercon 2016 if you want to meet some great people. Hopefully you’ll run into Arn, K0ZK. Ask him why he doesn’t apply for the vanity call sign K0TNT. It’s a great story.